Please note that details in the following may be out of date by the time you read this. This is especially so for any prices quoted here. Or in the standard legalise: "I provide no warrantee that the information is correct or that it should be relied upon in any way." 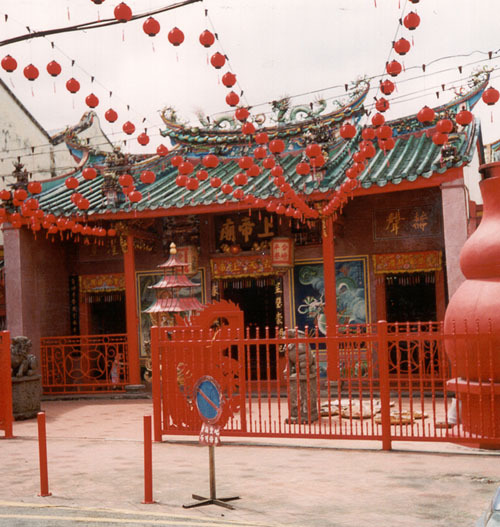 These are notes on my impressions of Kuching resulting from occasional visits, the most recent in February 2000 during the Chinese new year celebrations. They are designed to give other visitors a head start for their experience in the city. 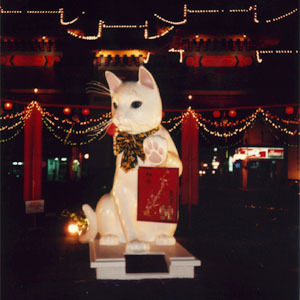 There is certainly an obsession with cats, statues large and small adorn parks and intersections. 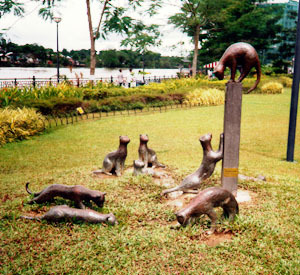 Unfortunately, while the statues are of healthy felines, the live variety invariably seem to be on the verge of starvation. It's hot and humid! It's generally around 32 - 35oC and I suspect around 90 - 95% humidity. A lot of visitors don't expect that sweat generally doesn't evaporate here as it does in Australia, for example. The hottest time of the year is from April until November. It is somewhat cooler around Xmas and New Year but you have to put up with the rain. The rain is quite predicable though and the inconvenience is well worth the cooler conditions. If you are from a cooler climate like myself definitely come equipped with shorts, light clothing, and lots of items to cope with frequent changes. It is advisable to get some local help. There seem at times to be an endless row of places to eat, most however only prepare one or two dishes. The cheapest fare gets you a large plate of noodles with some unidentifiable sauce for about 2 to 3 ringgit ($). It is relatively tasty but of questionable nutritional value. I think the noodles you meant are the "Mee Jawa" or roughly translated, Javanese-style noodles. I have no idea what it is either, but agree that it is of questionable nutritional value. Same goes for the "Kolo Mee" or plain dry (i.e., no soup) noodles with some pork and sometimes shrimp, etc. The only noodles I know of with some nutritional value are of the "Mee Sua" variety - rice noodles with a chicken drumstick in chicken/mushroom clear soup and usually some Chinese white wine (Yum.) for just under US$1. There are plenty of very nice places to eat, especially for seafood. My favourite was out of the city, north to Buntal. The butter prawns were divine! The problem with some of these places is they have no fixed menu, you are supposed to "discuss" your food with the waiter. While this is fine for the locals it is hard if you don't speak the language. For the less adventurous you can find the standard Pizza Hut, Kentucky Fry Chicken, and MacDonalds [Shame on you!]. There are also some local versions of essentially western fast food, one prominent example is called Sugar Bun. At the end of a hot walk there is nothing I preferred more than ice Kachang, A mixture of ground ice, condensed milk, jelly pieces, soya beans, and other unidentifiable chunky bits. Best place to get your ice-kachang (sometimes made with coconut milk) is at Hui Sing Garden hawker stalls that are surrounded by the shop-house blocks. Go to Ah Meng's, the second last stall. You can try the Metahorn or the White Lady, my favourites. By the way, the beans are red kidney beans, not soy beans. The black bits are called "cincau", no idea what that is in English. The green bits are cendol, made from flour paste and generally seasoned with pandan. One of the stranger snacks is called rojak. It is a combination of various vegetables and fruit mixed with a dark brown syrup. I have no idea what most of the ingredients are or what the syrup is made from and perhaps I don't want to know...it is quite tasty. It is best eaten straight away. Rojak is made with local fruits and fried tofu. Generally pineapple, turnip, water chestnuts, some cucumber and whatever else is handy. The black paste is basically flour with sugar and chilli powder with some black soy sauce. Make the most of fresh fruit drinks especially coconut which is served in the coconut itself and is best with ice. The tender coconut flesh is normally scooped out and eaten while or after drinking. One of the more refreshing drinks is star fruit drink. There are different conventions on when to pay for food. In the western style fast food places it is, as in other places, when you pick up your food. In the local small shops it is generally when they serve your order to your table, in the restaurants it is at the end of the meal just before you leave. The main thing I missed were breakfasts, the locals seem to eat similar food for breakfast as for any other meal. Milk, cereals, bread, etc are available at most new grocery stores. The taste of sterilised milk is somewhat different to fresh milk but not too objectionable. Note that only the more friendly places wait for you to finish your food before collection. More commonly these days they expect you to pay before you start. There are the following options, walking, buses, taxi, and car rental. Taxi's don't seem to "drive around" but rather congregate in a few key positions. There is also the unfortunate situation where not all taxi's can go anywhere, a particular taxi only services some roads or parts of town. This makes it hard to just flag a taxi and expect to be taken where you want. Taxis are mostly unmetered, you agree on a price given the destination before getting in! Generally visitors find such unstructured arrangements daunting, at least I do. I have noticed during my recent trips that the taxi pricing has normalised, so that a trip between the same placed gets charged the same amount irrespective of the taxi used. Buses are by far the best option, although most places are walking distance it is far too hot to do so. Most of the buses are not air conditioned so sit beside an open window. 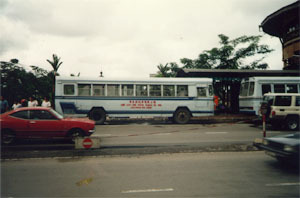 The bus drivers seem reluctant to provide any assistance to those who don't know where to go. The fares are cheap though, 40 cents gets you across town, the airconditioned buses generally cost a bit more and seem to make up perhaps half the fleet. Recently, the city council has provided a free "tram" service around the central city area. It isn't a "tram" but rather a strangely modified bus. Car rental is relatively expensive but is certainly a convenient way to get around especially if you plan to get out of the city. I didn't have a problem getting used to the driving environment, the local drivers are relatively courteous and don't travel fast, they do however tend to travel close together so sudden moves should be avoided. The frequent round abouts are the main thing to get used to, merge in slowly giving way to those on the right and "go with the flow". The other thing that is different from many places in the way the motorbikes weave in and out with seeming little regard for their own safety. Drive in the center of lane and mind your on business, they will negotiate around you. I was quite disappointed that it wasn't obvious where one could hire bicycles or even small motorbikes. The people who hire out motor bikes are located in all the oddest places, too. None of them seem to be anywhere near hotels. However, it's not a good idea to use a motor bike in Kuching these days. As you may have noticed, the cars don't bother trying to miss you as a pedestrian generally don't treat you much better as a biker. If I didn't know better, I'd say that they view you as a nuisance and generally try to overtake, although Kuching from end to end is only 7 minutes across at any speed. Be careful as a pedestrian, vehicles (drivers) don't seem to try to miss you. Don't get up early for shopping as most stores don't open until between 9am and 10am. On the other hand most will be open until 9 at night. If shopping is your thing do the department stores during the day (they are air conditioned) and visit the street shops at night. Much is made by the locals of pick-pockets in some of the small crowded streets, I suspect the danger is exaggerated but it pays to be careful. Pick pockets generally operate in crowded areas with easy access to quiet corners. India Street is one such place. You should mention that the shop staff generally expect customers to bargain for prices of local goods, and they quite enjoy it. The more they enjoy bargaining with you, the more likely you can walk off with a good discount. 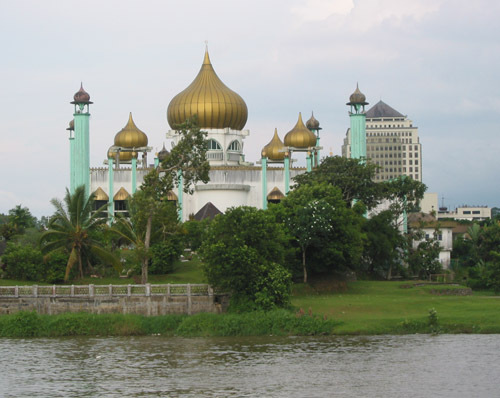 The main shopping centers are the Sarawak Plaza which is located centrally next to the Holiday Inn, Saborkas which is a short trip along Jalan Tan Haji Openg, and the Riverside Majestic. 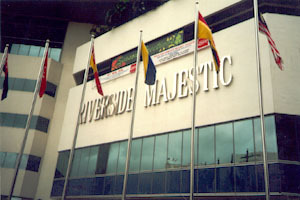 The Riverside Majestic has a good cinema complex and ten pin bowling alley on the top public floors. On my last visit there was also an archery range on the floor below the cinema. Be warned that while the latest movies are available they can be heavily cut to conform to stringent censorship requirements. It would seem that the pirate digital video industry is killing both the conventional video store as well as the cinema. The majority of people seem to have video-CD players, stores sell video-CD's for around 6 to 7 ringet, this includes the latest releases. The most striking thing about shopping in the large department stores are the large number of staff. There are almost always more staff than customers and there is a strange double receipt practice. Buying a simple item such as a pair of socks generally involves three people. One who shows you the goods, one who writes a receipt when you choose to purchase the item, and finally you present the item, receipt, and payment before leaving the store. 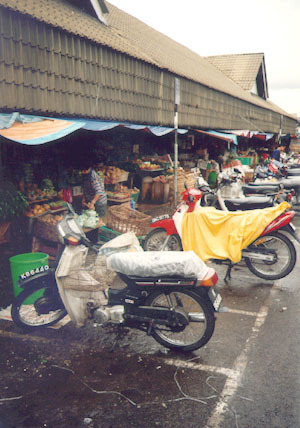 The food markets are located on the river-front, fruit, vegetables, and meat are displayed openly. I never had any desire to purchase meat this way but it's the best way to get fresh fruit and vegetables. In all but the large department stores you should feel free to ask for discounts on the displayed price. Just asking normally gets 10% off the price and you should feel free to ask for larger discounts if you feel like it. The whole process is somewhat arbitrary. Not the cleanest river in the world but then it's close to the ocean and therefore one expects it to be muddy. 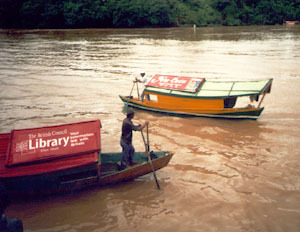 You can get across the river by small boats which regularly move back and forward. 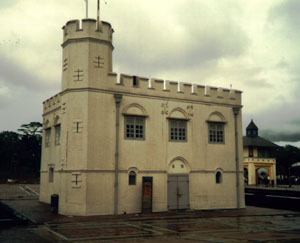 There isn't much reason to visit the river side opposite the city except for the Istana, a combined historical fort, police barracks, and garden park. 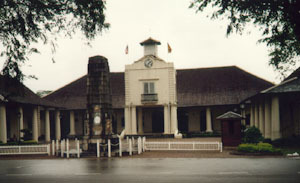 The Istana was built in 1870 by Rajah Charles as the governors official residence. The trip across the river is well worth it and only takes about 5 minutes. 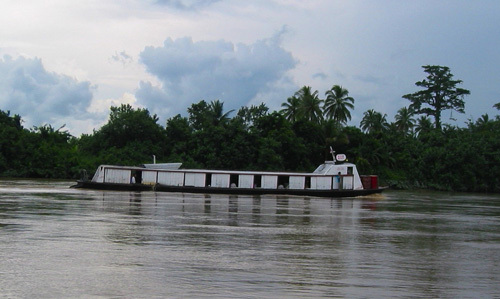 The boats are quite small and passengers can be told where to sit in order to maintain balance. This can be a bit embarrassing for the "larger" visitor who may weigh twice that of the average local. The boats are powered by either small motors or cross by oar using a strange sizzor action by a pair of oars. 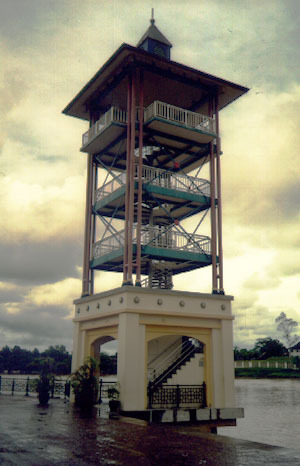 Near the end of 1994 the waterfront development was completed. This resulted in a pleasant walking route along the river front from the Holiday Inn to the bus/taxi depot at the far end of the city. The route is punctuated by places to grab a bite to eat or drink, and various entertainment sites. At the city end of the waterfront there is a musical water fountain, it used to play quite regularly but now it seems to be only once or twice a week. The Sarawak Tourist Information Centre is located by the main bazaar, try your luck, I passed it numerous times on a number of days and never found it to be open! The Sarawak Tourist Information Centre is open only during office hours and closed for 2 hours during Friday for prayers. River north of Sirian town. Tourist brochures make much of some of the local Architecture, I felt they were mostly over-rated. By the way, you forgot to mention our churches, some of which are rather quaint. I think the St Joseph's Church is quite nice. A worthwhile look at the start of your stay are the two monuments the South and North city councils have built for themselves. The City North building is about 15 minutes out of the city (over the river) on top a hill and commands good views of the area. 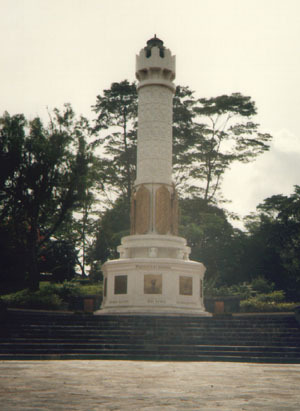 City South is closer to the center of city along Jalan Padungan. Some people might enjoy living up in the trees - if so maybe they would consider staying in the tree-top chalets at the Damai Rainforest Resort. Booking is through the Sarawak Tourist Information Centre. 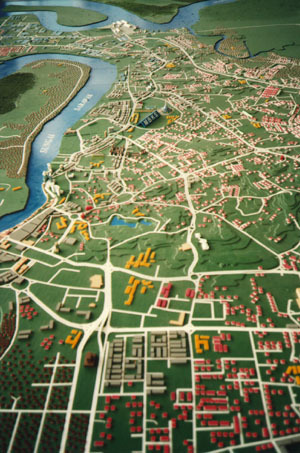 One reason for visiting these is they both have large models of the city and the surrounding area. The detail of these models is quite impressive and it is normally possible to pick out individual buildings. Next to the City South on Jalan Padungan are some public swimming pools. An excellent way of cooling down after a hot day in the city. 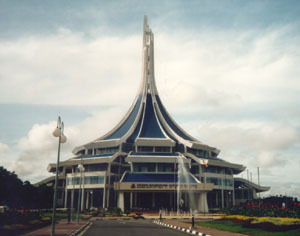 The Civic Centre building on Jalan Budaya also commands an excellent view of the city. 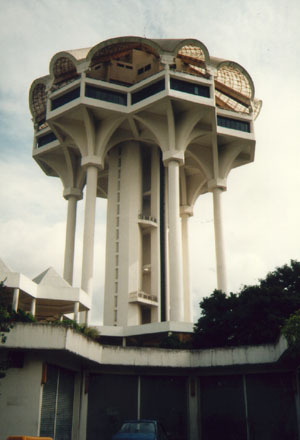 It also houses the reference library, the Kuching planetarium and some attractive gardens. 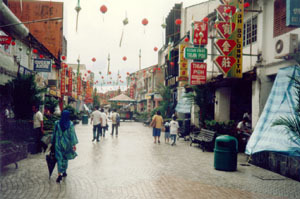 The museum is located centrally along Jalan Tan Haji Openg. It includes a large natural history collection and an Islamic section across the overhead bridge. For some strange reason you are not allowed to take photos. Behind the museum is a tropical fish aquarium. and adjacent to the museum grounds is Central Park, a lovely garden area and pond, go in the evening for a run or feed the fish. 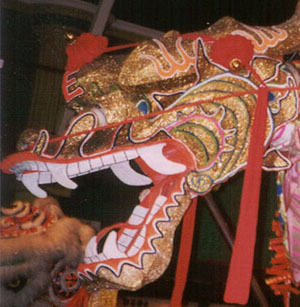 There is a Chinese Culture Museum as part of the waterfront development, opposite the Hilton. It is very small but has some interesting displays and information about the Chinese history in Malaysia. The housing estates are worth a look if you haven't seen such things before. They consist of areas just outside the city limits with row upon row of attractive modern houses.....all identical. Typically there will be 100 or more identical houses in such an estate. 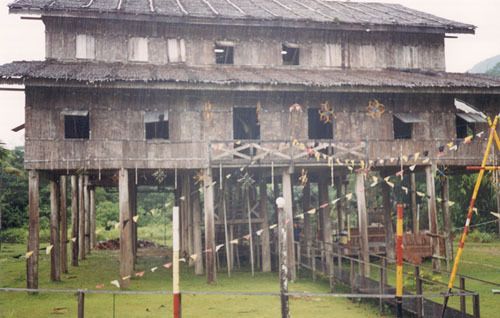 Longhouses, these are where the original Dayak people lived. As their name suggests they consist of one long building, usually mostly open insides. Unfortunately there are very few original style long-houses still in existence. Certainly the ones that tourists are taken to are unfortunately commercialised and I wouldn't recommend them, you can tell the real thing because they are built from wood and don't have solid internal walls. They are usually built on stilts to prevent flood damage, the animals are usually kept on the ground floor which makes for a smelly experience if there are pigs (usually are). "Express" boat up that goes up the river into the interior and some of the more authentic long-houses. 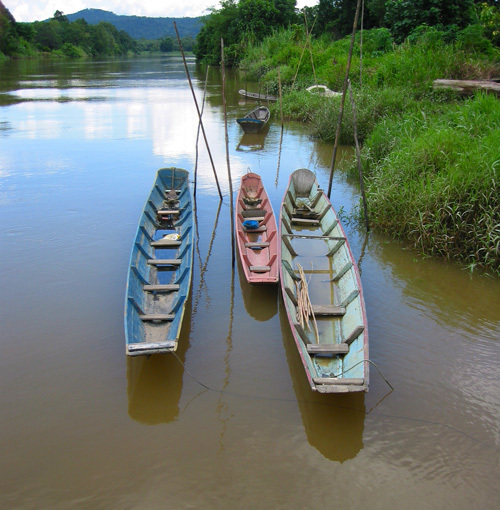 Canoes used by the locals to cross the river. 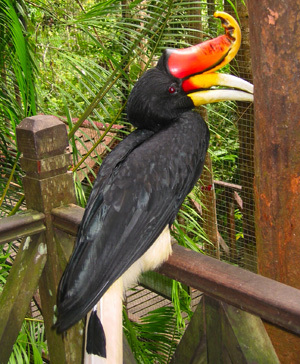 The Matang Wildlife Center is about half an hour (20km) north-west of the city. 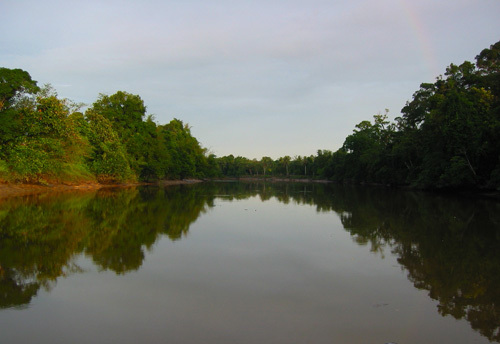 The Bako National Park is about the same distance to the north-east. About 40km south towards Serian is a crocodile farm and includes a small collection of local wildlife. 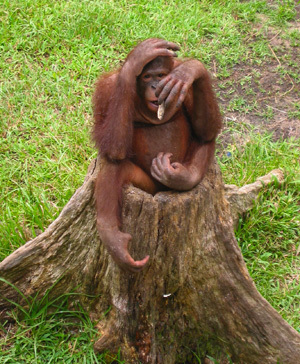 Unfortunately the animals in these zoos are not always kept in the conditions or health that many of us might like. 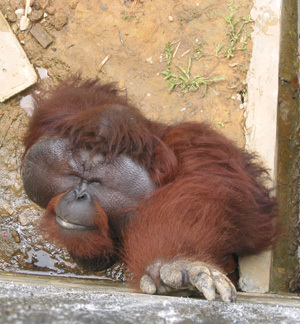 This was especially so for the animals in the Matang Wildlife Center in 2005, the enclosures were dirty and many of the animals looked as if they were in less than in good health. Lately indoor aquariums have become popular resulting in a number of fish pet stores opening. As a visitor it is unlikely that you want to buy aquarium fish, however it is worth visiting one. They are similar to aquariums at a zoo with a range of attractive and often large tropical fish. As expected there are a large number of temples around the city, mostly Buddhist, Muslim, with a few Hindu. 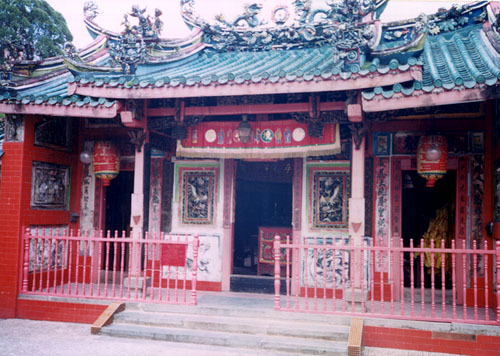 The most accessible temples are the Buddhist, the two more interesting are Tua Pek Kong which is located by the river at about the middle of the waterfront walk-way, the other is Kuan Yin located along Jalan Tabuan. 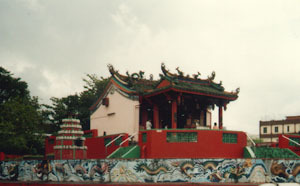 The Kuan Yin temple is identified by a large white statue of the goddess to the right of the temple. The environment inside the Buddhist temples can be quite oppressive as there is additional heat from fires and smoke from burning incense. There are also often furnaces for burning money (paper money) so the ancestors will have ready cash. 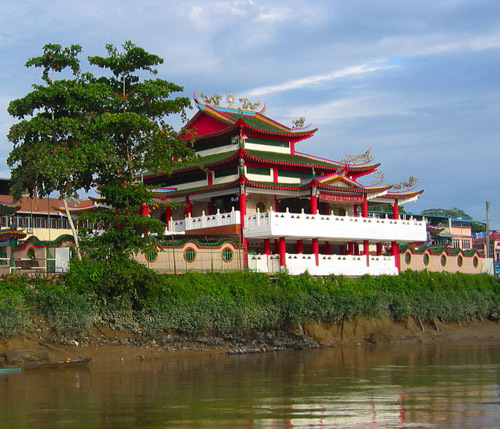 Temple on the river bank in Sirian, about 4 hours drive from Kuching. Perhaps the most inconvenient aspect of making your own way around the city are the public toilets. You need to keep a supply of 10 or 20 cent coins to gain access but most disturbing is they don't necessarily supply toilet paper. The potential user is required to carry suitable paper around. If you haven't been to the Asia region before you will also need to get used to the squat toilets. If you visit local homes or get out of the city it is likely that you will encounter washing basins or tanks instead of baths or showers. These are accompanied by small scoops for shifting the water from the larger reservoir to your body. The lack of warm water is not normally a concern! There is no shortage of banks, as with the shops don't go too early. Travellers cheques still seem the best way to take money, I didn't see any money machines which would take MasterCard, BankCard, or Visa. If you are interested in beaches and lying around in the sun then travel north to Damai beach and the Santubong resort. Near the Damai beach resort is the Damai Cultural Village showing the various cultural and racial groups within Malaysia and how they live. There is a show that runs for about an hour that you need to synchronise your visit with. If you don't want to participate then don't sit in the front row! It is certainly informative but I considered it over priced at 45 ringit for visitors. It costs 20 ringit for locals and anyone married to a local so you could always take a local friend and pretend to be married! If you feel lucky you can buy into the local lottery called 4D. You typically choose 4 single digit numbers and put as many $1 bets on that number as you like. The draw is made 4 times per week with the results published in the newspapers. Television programming I found quite poor. Television movies are rare and like the movies at the cinema heavily cut for censuring. The local English newspaper is the Borneo Post, it is published every day and reports on a good selection of local happenings. Going to Kuching during Chinese New Year has it's good and bad points. The main problem is that the shops are closed for about 4 days and there is a general slow down a few days on either side of that. The good thing is that you can experience the main Chinese celebration. 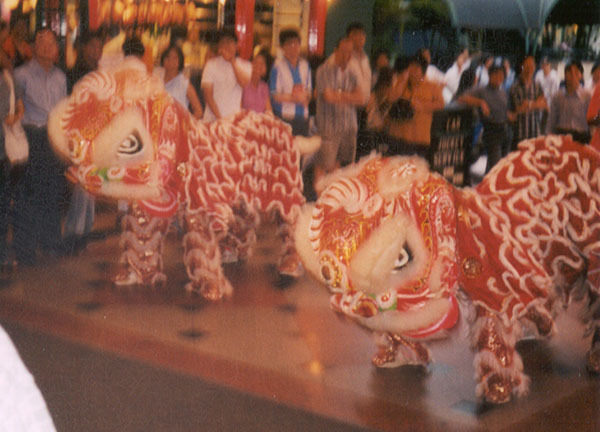 There are plenty of Lion dances around the city, normally outside temples, shops/houses seeking the benefits of the ritual, and inside shopping centres. During the evenings leading up and following the New Year there is a relatively regular firework display. Unfortunately the government seems to be outlawed many fireworks and the result is the spectacle is not nearly as great as in the past. Interestingly while "western" fireworks seems to concentrate on appearance (pretty colours etc), the Chinese New Year fireworks are designed for noise. The climax on the Chinese New Year night is as close as I can imagine to living in a war zone during a bombing raid. Internet access is readily available through a number of cafes. you full internet access. There are quite a few internet cafes around the city (23 according to the paper) but "CyberCity" seemed to be one of the better ones. 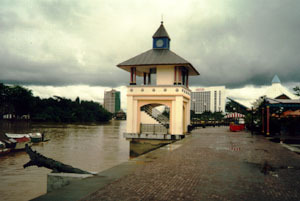 Captured from each side of the river-front (2003).